Say good-bye to spider mites! SNS 217™ and SNS 217C™ kills mites and their eggs. It is fully biodegradable and non toxic to animals. How it works: Natural salts and fatty acids derived from Rosemary extracts disrupt the insect cell structure. Cell contents then leak from damaged cells causing spider mites to dehydrate and die. 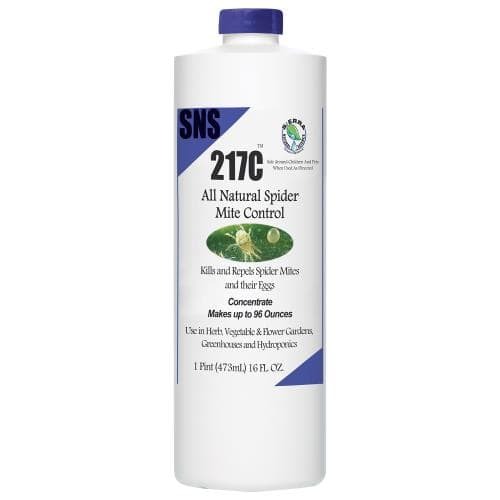 SNS 217™ kills the spider mite eggs by coating them with an oily shield that disrupts the respiration to the egg; therefore no hatching will occur, they will just dry out. SNS-217c™ Spider Mite Control Concentrate is made up of 100% pure Rosemary botanical extracts. The botanicals are all food grade GRAS (generally recognized as safe) materials. SNS-217c™ Spider Mite Control is exempt from EPA registration under minimum risk pesticides exempted under FIFRA section 25(b). Spider mites destroy plant cells by sucking out their contents and SNS-217C™’s unique formula works by providing a barrier which is harmless to the plant, but fatal to the mites.The natural salts from fatty acids derived from Rosemary extracts disrupt the insect cell structure and permeability of its membranes. Cell contents then leak from damaged cells and the spider mites quickly die. Some of the components of SNS-217C™ are also absorbed by the plant and then suppress the life cycle of the mites. SNS-217C™ Spider Mite Control kills the spider mite eggs as well by coating the eggs with an oily shield that disrupts the respiration to the egg; therefore no hatching will occur, they will just dry out our product has been tested in our lab on delicate new growth, clones, tomatoes, roses and other plants. SNS-217C™ Spider Mite Control can be used on a wide variety of plants, vegetables, and even trees. When applying the product take caution not to spray any buds on the plant, in doing so this could result in burning the buds sprayed. SNS-217C™ Spider Mite Control can be sprayed on fruits, vegetables, and plants varying from; apples, apricots, beets, broccoli, cabbage, carrots, cauliflower, celery, cherries, chives, corn, cucumbers, peppers, tomatoes, parsley, fuchsia, roses, flowers, house-plants, etc. SNS-217C™ is fully biodegradable and is not toxic to animals. When used as directed it will not reduce the plant’s metabolism. Shake vigorously. Mix 25.6 oz of concentrate per gallon of water. For best results use warm (70 degree) Distilled or “Chlorine Free” water. Mixed solution may be stored or used immediately. Complete coverage of all plant tissue is necessary for control. Make sure to spray under the leaves where spider mites hide and lay their eggs. To reduce the chance of burning do not use under direct sunlight or grow lamps. One thorough application is usually enough, but heavy infestations may require a few more. Use on a 7-14 day schedule for preventative maintenance. Do not use with other oil based products as they may block our product from working.